The boarding school experience for Indian children began in 1860 when the Bureau of Indian Affairs established the first Indian boarding school on the Yakima Indian Reservation in the state of Washington. These schools were part of a plan devised by well-intentioned, eastern reformers Herbert Welsh and Henry Pancoast, who also helped establish organizations such as the Board of Indian Commissioners, the Boston Indian Citizenship Association and the Women’s National Indian Association. The goal of these reformers was to use education as a tool to “assimilate” Indian tribes into the mainstream of the “American way of life,” a Protestant ideology of the mid-19th century. Indian people would be taught the importance of private property, material wealth and monogamous nuclear families. The reformers assumed that it was necessary to “civilize” Indian people, make them accept white men’s beliefs and value systems. Boarding schools were the ideal instrument for absorbing people and ideologies that stood in the way of manifest destiny. Schools would quickly be able to assimilate Indian youth. The first priority of the boarding schools would be to provide the rudiments of academic education: reading, writing and speaking of the English language. Arithmetic, science, history and the arts would be added to open the possibility of discovering the “self-directing power of thought.” Indian youth would be individualized. Religious training in Christianity would be taught. The principles of democratic society, institutions and the political structure would give the students citizenship training. The end goal was to eradicate all vestiges of Indian culture. By the 1880s, the U.S. operated 60 schools for 6,200 Indian students, including reservation day schools and reservation boarding schools. The reservation day school had the advantage of being relatively inexpensive and caused the least opposition from parents. The reservation boarding school spent half a day teaching English and academics and half a day on industrial training. Regimentation was the order of the day and students spent endless hours marching to and from classes, meals and dormitories. Order, discipline and self-restraint were all prized values of white society. The boarding schools hoped to produce students that were economically self-sufficient by teaching work skills and instilling values and beliefs of possessive individualism, meaning you care about yourself and what you as a person own. This opposed the basic Indian belief of communal ownership, which held that the land was for all people. At this juncture, it was felt that reservation schools were not sufficiently removed from the influences of tribal life. In the eyes of assimilationists, off-reservation boarding schools would be the best hope of changing Indian children into members of the white society. For Col. Richard Henry Pratt, the goal was complete assimilation. In 1879, he established the most well known of the off-reservation boarding schools, the Carlisle Indian School in Carlisle, Pennsylvania. As Headmaster of the school for 25 years, he was the single most impacting figure in Indian education during his time. Pratt’s motto was, “Kill the Indian, save the man.” Pratt believed that off-reservation schools established in white communities could accomplish this task. By immersing Indians into the mainstream of American life, the “outing” system created by Pratt had students living among white families during the summer. He hoped Indian youths would not return to the reservations but rather become part of the white community. Carlisle was the only off-reservation boarding school built in the East; all others were built in the West. Carlisle and other off-reservation boarding schools instituted their assault on Native cultural identity by first doing away with all outward signs of tribal life that the children brought with them. The long braids worn by Indian boys were cut off. The children were made to wear standard uniforms. The children were given new “white” names, including surnames, as it was felt this would help when they inherited property. Traditional Native foods were abandoned, forcing students to acquire the food rites of white society, including the use of knives, forks, spoons, napkins and tablecloths. In addition, students were forbidden to speak their Native languages, even to each other. The Carlisle school rewarded those who refrained from speaking their own language; most other boarding schools relied on punishment to achieve this aim. At the better boarding schools, students could attain a reasonable degree of English literacy in a relatively short period. At other schools, the method of teaching — an object card such as CAT shown to students, then written, pronounced and traced — failed to produce a comprehension of those words that had no equivalent in their Native tongue. The Indian boarding schools taught history with a definite white bias. Columbus Day was heralded as a banner day in history and a beneficent development in their own race’s fortune, as only after discovery did Indians enter the stream of history. Thanksgiving was a holiday to celebrate “good” Indians having aided the brave Pilgrim Fathers. New Year’s was a reminder of how white people kept track of time and George Washington’s birthday served as a reminder of the Great White Father. On Memorial Day, some students at off-reservation schools were made to decorate the graves of soldiers sent to kill their fathers. Half of each school day was spent on industrial training. Girls learned to cook, clean, sew, care for poultry and do laundry for the entire institution. Boys learned industrial skills such as blacksmithing, shoemaking or performed manual labor such as farming. Since the schools were required to be as self-sufficient as possible, students did the majority of the work. By 1900, economic practicality became the goal and school curriculum slanted even further toward industrial training while academics languished. 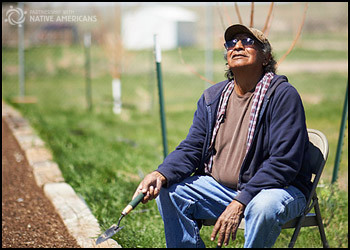 The Carlisle school developed a “placing out system,” placing Indian students in the mainstream community for summer or a year at a time where they could learn skills other than farming. While monitored carefully at Carlisle, other outing programs were often exploitive. At the Phoenix Indian School, girls became the major source of domestic labor for white families, boys were placed in seasonal harvest or other jobs unwanted by white or immigrant laborers and the students were unsupervised, learning very little from their outing experiences. The Carlisle and Phoenix schools also had football teams, and Phoenix had a band that performed at summer parades and festivals. These activities were meant to support the idea that Indian people were capable of competing with whites. Conversion to Christianity was also deemed essential to the cause. Indian boarding schools were expected to develop a curriculum of religious instruction, placing emphasis on the Ten Commandments, the Beatitudes and Psalms. Implanting ideas of sin and a sense of guilt were part of Sunday schools. Christianity governed gender relations at the schools and most schools invested their energy in keeping the sexes apart, in some cases endangering the lives of the students by locking girls in their dormitories at night — meaning they could not get out, even in the case of fire. There were, however, ritualized social activities such as dances and promenades. Discipline within the Indian boarding schools was severe and generally consisted of confinement, deprivation of privileges, threat of corporal punishment or restriction of diet. In addition to coping with the severe discipline, Indian students were ravaged by disease at boarding schools. Tuberculosis and trachoma (“sore eyes”) were the greatest threats. In December of 1899, measles broke out at the Phoenix Indian School, reaching epidemic proportions by January. In its wake, 325 cases of measles, 60 cases of pneumonia, and 9 deaths were recorded in a 10-day period. Naturally, Indian people resisted the schools in various ways. Sometimes entire villages refused to enroll their children in white men’s schools. Indian agents on the reservations normally resorted to withholding rations or sending in agency police to enforce the school policy. In some cases, police were sent onto the reservations to seize children from their parents, whether willing or not. The police would continue to take children until the school was filled, so sometimes orphans were offered up or families would negotiate a family quota. Navajo police officers avoided taking “prime” children and would take children assumed to be less intelligent, those not well cared for or those physically impaired. Indian parents also banded together to withdraw their children en masse, encouraging runaways and undermining the schools’ influence during summer and school breaks. An 1893 court ruling increased pressure to keep Indian children in Boarding schools. It was not until 1978 with the passing of the Indian Child Welfare Act that Native American parents gained the legal right to deny their children’s placement in off-reservation schools. Some Native American parents saw boarding school education for what it was intended to be — the total destruction of Indian culture. Others objected to specific aspects of the education system, the manner of discipline and the drilling. Still others were concerned for their children’s health and associated the schools with death. Resentment of the boarding schools was most severe because the schools broke the most sacred and fundamental of all human ties, the parent-child bond.